For carers looking to fund their children’s education, there are a wealth of options that advisers can guide them too. Accumulating funds in a child’s name is generally not suitable as the unearned income of a minor is taxed at the top marginal tax rate (currently 45 per cent excluding the Medicare levy) if total unearned income exceeds $1,307. The choice of funding option will depend on a range of issues, including the facility cost, tax efficiency, investment risk and practical convenience. Accumulating funds in a lower earning spouse’s name (sometimes as trustee for the child) can be attractive for a number reasons: as a strategy, it is straight-forward, transparent and flexible. This option may be as simple as opening a bank deposit account in the relevant spouse’s name and arranging regular funds transfers from an existing transaction account or direct credits from payroll. However, as an education funding scheme may be a long-term proposition, the relatively low interest rate applicable to bank deposit accounts may be a deterrent. Alternatively, a wrap-style account may allow exposure to growth assets with higher long-term investment return expectations, but increased risk due to the potential return volatility. With either option, funds can be accessed at any time, and the investor retains control of the funds and, in a wrap account, the investment mix at all times. In addition, this option can be very tax efficient if the spouse has a low level of taxable income. Individuals with less than $21,595 of taxable income in 2018-19 will not pay any income tax. But if income increases, for example because of a return to the workforce, then the tax efficiency may decrease. Gerry left the workforce two years ago to become the primary carer for his young child who is now age three. His wife Julie’s income has recently increased to $220,000 per annum after a promotion. Gerry and Julie anticipate their child will attend a State Government primary school, a private secondary school and hopefully progress to university. They have $12,000 to start an education funding plan and will contribute an extra $12,000 per annum in future years. Chart one shows an education funding plan in Gerry’s name using a bank deposit account and a balanced portfolio through a wrap account, along with the impact of Gerry’s income increasing to $50,000 per annum in five years. See calculation assumptions below. 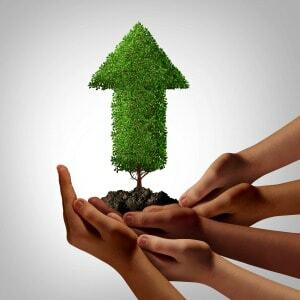 The higher returns expected from a balanced portfolio with growth assets results in a more attractive long-term result. In practice, the returns from a balanced portfolio will vary each year. Whether this portfolio is suited to a particular investor should be determined on a case-by-case basis. Using a mortgage offset account is also a straight-forward, transparent and flexible option. Returns are effectively accrued at an after-tax interest rate equivalent to the interest rate being charged on the outstanding mortgage debt. Funds can usually be withdrawn at any time, for any purpose. This option will become more effective if mortgage interest rates rise in the future but will be reduced in effectiveness if they decline. Importantly the effectiveness of this option is independent of any change in Gerry’s taxable income and marginal tax rate. Investment returns within investment bonds are taxed at 30 per cent, with no capital gains tax (CGT) discount applying. Depending on investment return assumptions, including the amount of capital gains, investment bonds can be more tax effective than investing in an individual’s personal name where their marginal tax rate exceeds 39 per cent (including the Medicare levy) and the investment bond is held for 10 years or more. Whether they are more or less effective than personal investment at the 39 per cent marginal tax rate is heavily dependent on the return assumptions. If an investment bond is realised within 10 years, the outcome is generally less tax effective if the bond holder’s income exceeds $37,000. Gross returns generated by an investment bond will depend on the underlying portfolio of assets. Some investment bond providers allow a wide choice of asset allocations, often ranging from very conservative exposures to those with a high exposure to growth assets. But investment control is limited for the individual, other than switching from one portfolio to another, with either less or more exposure to growth assets. Withdrawals can be made at any time but may have personal tax implications if they occur within the first 10 years. Education bonds are similar to investment bonds in many ways. For example, investment returns are taxable at 30 per cent (with no CGT discount), paid by the education bond provider. Education bonds have the added benefit of a tax refund paid to the education bond provider if the bond earnings are withdrawn and used for the bond holder’s education purposes. This refund is generally passed on to the bond holder and is broadly $30 for every $70 of bond earnings withdrawn for education expenses. Costs such as uniforms, private tuition, books, materials, student fees, residential boarding costs, rent and other accommodation expenses. Be sure to check the individual policy wording regarding which expenses the education bond provider allows. Withdrawals of bond earnings are generally assessable income of the bond holder, so limiting withdrawals to the tax-free threshold of the bond holder is ideal. For a child less than age 18, the tax-free threshold on unearned income is $416. From age 18, the tax-free threshold is effectively $21,595 in 2018-19. Withdrawn contributions, on the other hand, are not taxable. Many education bond providers allow bond holders to nominate what proportion of a withdrawal is taken from earnings versus contributions, allowing the tax-free threshold to be targeted, with the balance withdrawn from contributions. Some education bond providers allow a wide choice of asset allocations, often ranging from very conservative exposures to those with a high exposure to growth assets. But beyond broad portfolio selection, investment control is limited for the bond holder. A family trust may be suitable for education funding but may involve significant establishment costs. Family trust distributions may be limited to each family member’s tax-free threshold, or potentially the higher threshold of $37,000 which applies to the 21 per cent marginal tax rate (including the Medicare levy). Otherwise distributions can be made to a corporate beneficiary, taxable at 30 per cent. 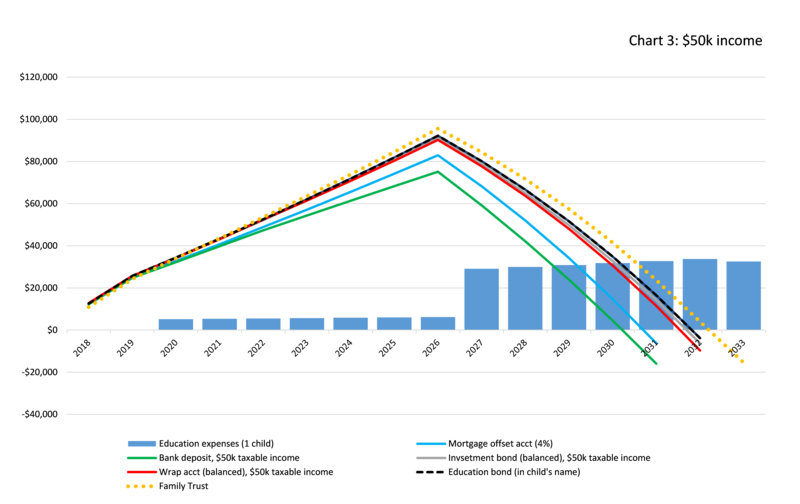 If the after-tax distributions are re-contributed to the trust, the effective average rate of tax on the trust’s investment returns may be lower than the 30 per cent rate that applies to investment bonds. Depending on the age, taxable income and number of family members, a family trust may or may not be as effective as an education bond. Some financial services professionals recommend a family trust strategy that invests in an education bond, which may combine the benefits of both options. Gerry and Julie have a mortgage debt which attracts interest at 4.0 per cent per annum, and a mortgage offset account facility is available at a cost of $248 per annum. It is assumed a family trust may be established for $1,500. Otherwise, all options are assumed to attract the same level of fees. 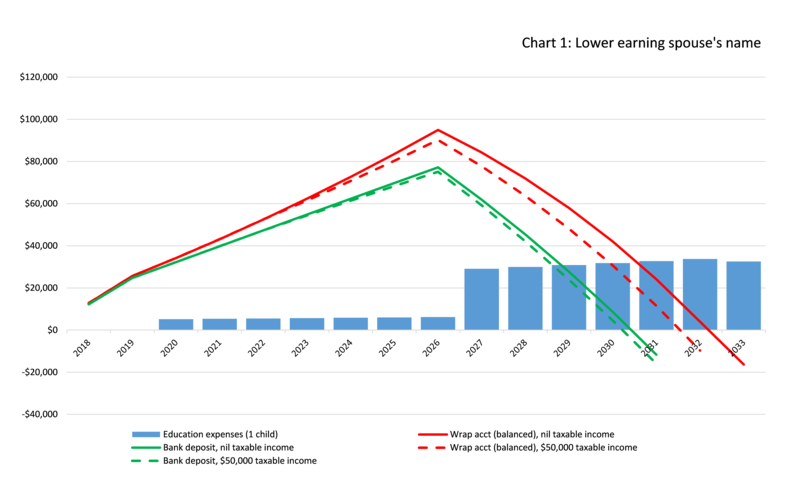 Chart two below illustrates the education funding options described in this article, assuming Gerry’s taxable income is nil, and chart three if Gerry’s taxable income increases to $50,000 in five years. In both cases the family trust is the most attractive option. As in chart one above, charts two and three show that exposure to growth assets via a balanced portfolio contributes significantly to the overall outcome due to the higher expected return rate. 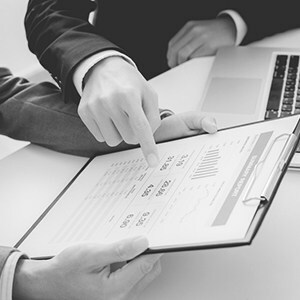 In practice, the returns from a balanced portfolio will vary each year, and whether this portfolio is suited to a particular investor should be determined on a case-by-case basis. David Barrett is head of Macquarie Technical Services at Macquarie Wealth Management. Balanced portfolio return rate: 6.72% p.a. 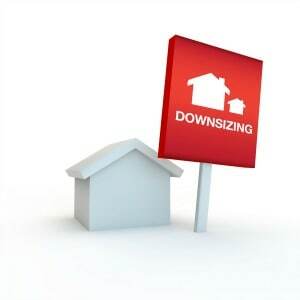 Mortgage interest rate: 4.0% p.a.